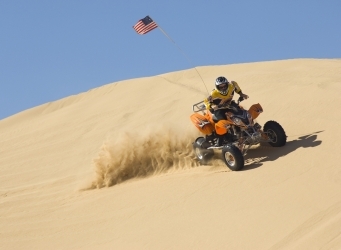 Whether your Memorial Day plans include a motorcycle rally, ATV riding across some dunes, a mellow bike ride with the family or time spent out in the yard, your fun can too easily be ruined by a flat tire. From bicycles to wheelbarrows, Slime sealant can help you be worry free this weekend. It is all about prevention when it comes to the tires in your recreational toys. Before heading out, quickly add Slime sealant to your non-highway tires to prevent punctures up to 1/8” (3mm) in diameter. Slime works repeatedly to instantly seal new and existing punctures for up to 2 years. After insertion, pump up your tires and you are ready to go. Tip No. 1: Air up! Not only do fully inflated tires help keep you safe on the road, they also save you precious dollars at the pump. With gas prices currently averaging about $2.34/gallon (an 11 cent increase since last Memorial Day weekend), a few moments with your trusty inflator can keep more dollars in your wallet. Tip No. 2: Be sure to throw a can of Quick Spair into your trunk before hitting the road. A fast, one-step emergency tire repair kit, Quick Spair sends a mixture of sealant and compressed air into your tires to seal up any punctures so you can get back on the road quickly, and most importantly, safely. No matter your plans this holiday weekend, be safe out there! Have a great Memorial Day everyone.